Eric Barker | Attorney At Law | Criminal Attorney Eric Barker, Esq. Everyone from the falsely accused, first time offender or the career offender deserves to have a lawyer who will fight for them and protect their rights. 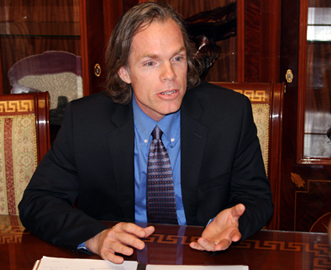 Orlando attorney Eric Barker has practiced criminal defense exclusively for 20 years. He has law partners that concentrate in Immigration, Personal Injury, and Civil law to ensure that all my client’s interests can be protected. Don’t make the mistake of waiting until the last minute to hire an attorney. 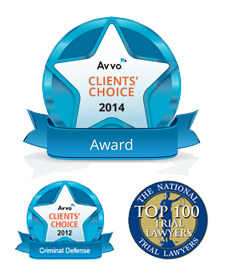 Hire an EXPERIENCED attorney now to analyze your case and prepare your defense. Initial consultations are always free of charge. Know your rights. Call Eric today. Eric Barker has always been a criminal defense lawyer, fighting for his clients' rights and freedom throughout his career. He prides himself in thoroughly analyzing and diligently preparing for each client's case through detailed investigation, including the location and questioning of witnesses, law enforcement officers or other leads in his clients' cases. 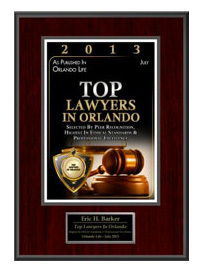 Eric was recognized as one of Orlando's top lawyers in 2013 as published in Orlando Life Magazine. Actual Client Testimonial: "Eric represented my son in a very difficult case. It was clear from the beginning he cared. Forget the lawyer/shark jokes. This man has a heart of gold. He helped us through 3 difficult years and achieved a favorable outcome."